The Brewpub Series from Feral produce some of the most sought after new release beers in Australia. Hopfen Fahrt is ostensibly an American style IPA brewed with German hops and it is a beer that I'm really intrigued to try. Very few German style beers are heavily hopped, so this will be interesting. 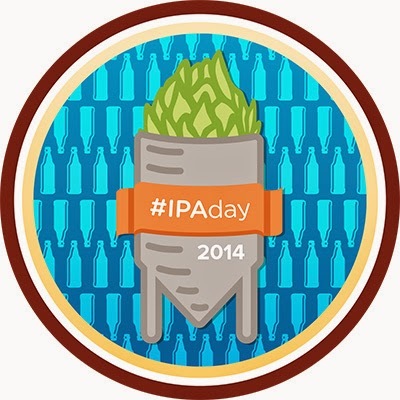 The reason we are here today is because it's IPA Day! This year International IPA Day fell on Thursday August 7th and I felt it fitting to celebrate with an Australian made example of the style. Untappd mark this celebration every year with a badge and so we welcome Feral's Hopfen Fahrt (Hoppy Ride if my high school German serves me correctly...) into the club of IPA Day Badge earners alongside To Ol's Dangerously Close to Stupid from last year. 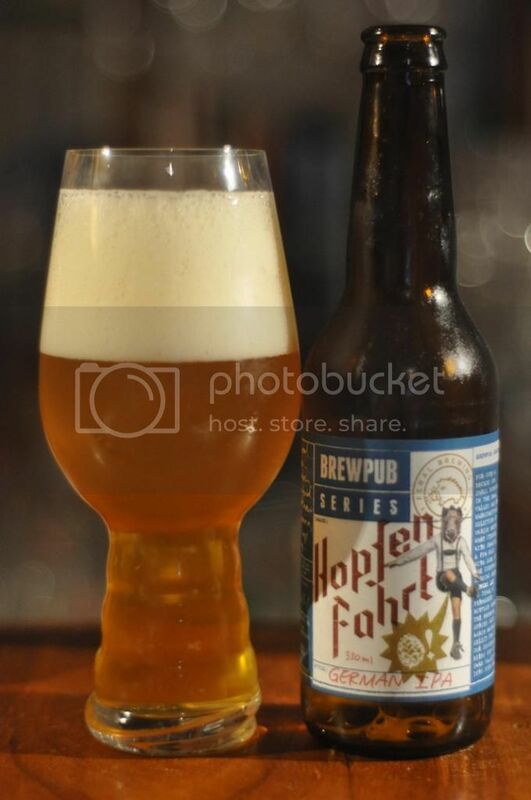 Hopfen Fahrt pours a perfect slightly hazy golden colour with a bulbous white head. The head is made up of small tight bubbles and has plenty of retention but only minor lacing. Personally I advocate for clearer IPA's but I think this still fits the style guidelines, it's certainly a good looking beer, although I think all beers look good in the Spiegelau IPA glass! We're moving onto the nose now and this is quite unlike any IPA I've smelt before. Firstly the aroma is very short lived, however while it is there the malt is light. The hops are really odd, at the start I think I smell grapefruit but then the dominant flavour is something like a cross between lemongrass (I think...) and ginger. A really unique nose! The taste is also unique; I've decided I'm going to call the malts bready in flavour - that's not quite right but it'll have to do. There are hints of grapefruit coming from the hops as well as rockmelon and this odd lemongrass/ginger flavour. It does have good bitterness though and the mouthfeel is nice and creamy. For me, this beer was a really good idea, it just didn't quite work in actuality. I didn't think the hops really lent themselves to the style at all and having had it on tap I don't think it's much better there. It's a beer that confuses me quite a bit actually, I know a number of people who rave about it. I'm going to take this opportunity, in case the Feral guys are reading this, to start a petition for Watermelon Warhead to be the next Brewpub Series release! It's one of my favourite beers!